Today's kids are growing up knowing they could be injured or even killed in a school shooting at any time. January 22: Italy, Texas - A 16-year-old student opened fire with a semi-automatic handgun in the school cafeteria, wounding another student. January 22: Gentilly, Lousiana - An unknown person fired shots at students from a vehicle in the school parking lot. One person was injured. January 23: Benton, Kentucky - A 15-year-old student opened fire with a handgun, killing two and injuring 17. January 25: Mobile, Alabama - A student fired a handgun during a fight with another student. No injuries reported. January 26: Dearborn, Michigan - Shots were fired during a fight in the school parking lot. No injuries reported. January 31: Philadelphia - A fight during a basketball game resulted in a shooting death outside the school. February 14: Parkland, Florida - A 19-year-old former student opened fire with a semi-automatic rifle, killing 17 and injuring 14. As children see these shootings unfold on the news, it can be paralyzing. It's critical, as children's ministry leaders, that we are available to help children as they try to process these events. Just as important, if not more important, is our role in equipping parents to know how to walk with their children through these tragedies. It can be difficult to know what to say and how to respond when kids (and adults) see school shootings unfold. Let's look at some helpful tips on how to talk with children about this. Protect them from too much information. Limit their exposure to media coverage. Remember, even when they are playing with their toys in the same room, they are aware of what is on the television, radio or social media you are engaging in. Exposure to disturbing images and conversations can heighten children's distress. Focus more on the child's feelings about the event than on the event itself. The primary goal is to help children cope with their feelings in a healthy way. An example is a child asking if it could happen at their school or their parent's workplace. What the child really wants to know is if they are safe or not. Go over safety measures and plans you have in place and reassure the child of their safety. Understand what they can process developmentally. The goal is to answer their questions without increasing their distress. It's important to know what kids can process at their age level. Elementary children obviously understand more than preschoolers and will want to talk about shootings at greater length. This doesn't mean you should offer disturbing details. They need comfort and reassurance of their own safety. It is also important during this time to give them extra attention. Pre-teens need adults to listen to their thoughts and feelings about the shooting. They highly value honesty, so it's important to answer their questions that way. While pre-teens may not be as quick to ask for your help and support, rest assured they need it. Find ways they can help and expose them to others who are helping. Children benefit greatly from being able to make a positive difference in the lives of others. When they see and hear stories of people helping those effected by the shooting, it can help bring healing and reassurance. Why didn't God stop this from happening? Why didn't God protect the children and adults who were shot? These are questions that all of us have grappled with at times. It's important to help guide kids through the hard questions that arise from tragedy. Seek professional help if needed. 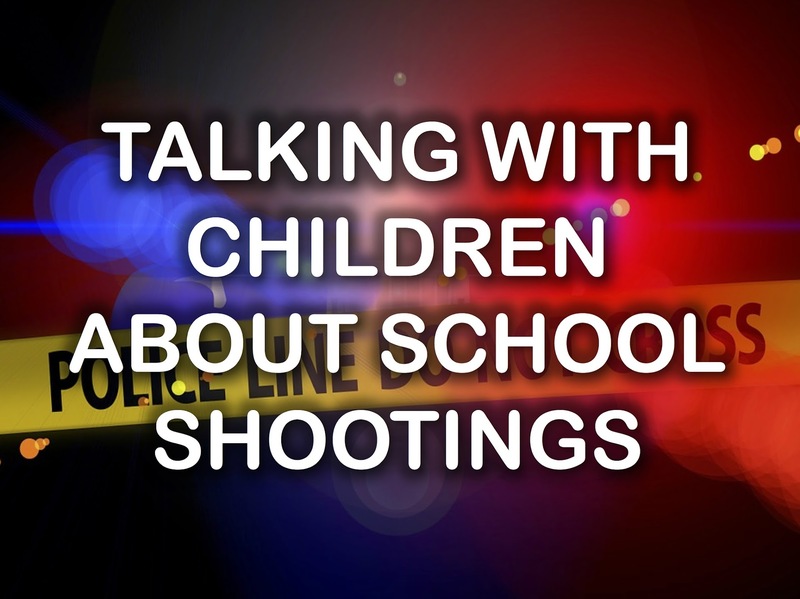 It's common for children to feel anxious about a school shooting. They may have trouble with their behavior and concentration. It can even cause a change in their appetite or sleep routines. If this happens and reaches the point where it's interfering with the child's ability to function, you should seek professional help.